In this photograph, at the Renaissance New Orleans Pere Marquette Hotel in downtown NOLA, the bride and groom gaze in each others direction (but can't actually see each other). This was a rare instance when I was able to capture an image of both the bride and groom together without them having done a first look (not counting the occasional instance where the couple is back-to-back, perhaps separated by a door, holding hands or exchanging gifts and letters). As cool as this picture is, in all fairness I can't take full credit for it, as the idea was brought up by one of the bridesmaids. 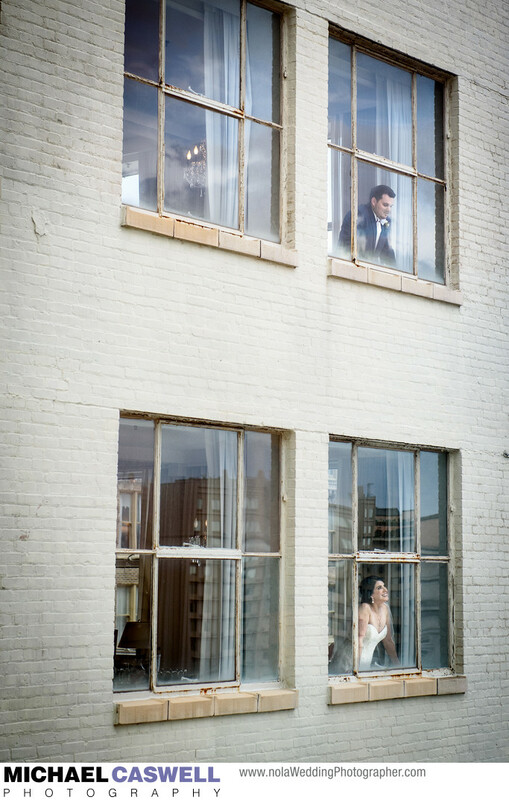 When she had been walking to the bride's room from the elevator, she noticed that a window in the hallway around the corner provided a view of the exterior of the rooms where the bride and groom were getting ready. After the wedding, the couple ordered a large canvas print of this photograph, which now hangs in their New Orleans home. Location: 817 Common St, New Orleans, LA 70112.